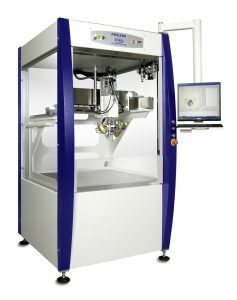 The FRC500 soldering robot is a PC controlled robot allowing the automation of soldering operations. A great variety of industrial micro-soldering tasks can be carried out quickly, with the highest quality and with repeatability. The FRC500 robot from MTA is designed to either work stand-alone or to be easily integrated into existing lines. It can be fitted with either 3 or 4 axis and a number of different soldering heads. The product can be presented in either fixed tooling, on conveyor, rotary table or delivered by a shuttle system. The robot can be supplied fully fixtured and programmed as a turnkey solution. Fully programmable via industrial PC. 500 * 500 mm working area. Fast quiet X, Y, Z, and Theta axis.